Atlantic Geothermal posted a link to a video by Jeff Hayes discussing Tesla Turbines. This served to remind me about these turbine/pumps and other “dead” technologies like Stirling engines. This technology is relevant as many geothermal resources have extremely high total dissolved solids (like the Salton Sea) that are expensive to harvest with conventional turbine technology. Conventional turbines consist of a shaft with blades mounted upon it. This looks very much like closely spaced propeller blades that are pushed by pressure exerted through gas or air which causes the shaft to rotate. 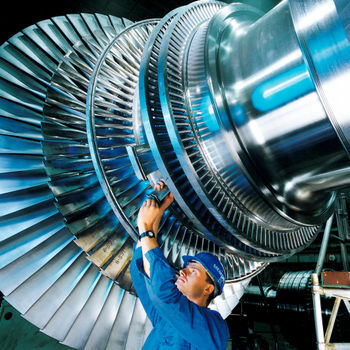 Conventional steam turbines have inlets near the center of a shaft with the gas/steam expanding out toward the ends with the blades becoming progressively larger from the center to the end. See the photo below of a conventional steam turbine shaft and blade assembly, the far right of the photo is where the gas/steam enters on this model and it expands and exits on the left. These turbine shaft/blade assemblies can weigh as much as 40 tons and spin at 3,600 rpm. That’s alot of mass spinning very fast. When a steam resource with high total dissolved solids is pushed through conventional turbine systems, it results in scaling, friction, and loss of efficiency. The higher the TDS, the more frequently these devices require maintenance, expensive both in absolute terms and lost opportunity. The Tesla turbine is a completely different animal. Rather than depending upon blades, it depends on centrifugal force created by adhesion of the steam/gas to large, smooth surface areas of closely spaced rotor disks. See the drawing below to get a sense of the difference between the Tesla system and conventional turbines. The figure on the left shows an end on view of the device with the shaft pointed toward the reader. One rotor is visible in this elevation with steam/gas entering on the top right of the device and exiting through the top left. Modern designs have only one inlet with the exhaust coming through the shaft region, this is important because as the rotors spin the gas is being pulled toward the shaft in a tight series of concentric circles. Today, Tesla turbines are used commonly as pumps for viscous materials (like crude oil) but have not found a place in turbine engine use as yet. The Department of Energy has dismissed Tesla turbines from consideration stating that “they don’t work” when compared against conventional turbines – although, this isn’t true when operated at high rpm which is the design center. So, will we see any Tesla turbines in operation? I wouldn’t bet on it in the near future, but longer term, it wouldn’t surprise me in the least to see a geothermal plant using this technology in the next 10 years. This entry was posted on Monday, April 2nd, 2007 at 8:52 am	and is filed under Geothermal. Though true that Tesla’s original design was flat and smoothe, he had other designs that worked much better including one that used jagged surfaces and wavey surfaces to increase the pressure of the adhesion as the gas was “directed” through the discs. Perhaps you should lood into that. I am MS student of mechanical engineering of Tabriz University and working on a project about centring methods of aircraft gas turbine discs on the shaft in a tight contact and preventing them from being loose due to centrifugal forces. I need your guidance in this subject as a start point. I would be grateful if you helped me. i am basicaly an Electrical Engineer and i love Electrical Machines.I will love to see more assignment over this topic. i need your help in how do you design a turbine , i want to know your approach. i really want to integrate my maufacturing unit. so please help me , i shall be highly obliged. and at the last stage of turbine shrouding is not mounting why? As I understand Tesla’s experience with the system, he found limitations in the materials available for the disks. Operating with steam as power source, and requiring high RPM operating speed, metals available were limiting in that they were not able to withstand the velocity, and the temperatures, owing to the high inertia loads on the outer portion of the rotor disks. Today however we have available alternate materials, including some strong and tough ceramics, such as zironia (yttria stabliized) toughened alumina which might work well as a disk material. The other limitation may be lack of experience by the mainstream of engineering. 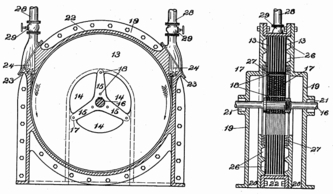 Without any understanding of the concepts by Tesla contemporaries; and extensive experience already in construction of other steam turbine designs, there was no further development on the Tesla system to actually see what developed. Is it not the case that other then the large demonstrator built by Tesla himself, the only other examples are table top demonstrations by hobbyists and students? This does not seem to be a fair trial or effort at development. Is anybody manufacturing a smaller Tesla Turbine (10Kw-100KW) and if so who are they, where are they, and how do I get in touch with them? i have invented a new design of an aqua turbine. the concept has been ascessed as being very promissing. right now it is in the hands of an engineer drawing up the spects. i will be looking for a company to ascess my invention and to possibly build it for me. It is a high speed turbine. hi Frank,now i am going to design 60kw power of Tesla turbine,i was design thermal calculations,so who are they will touch me ,will improve design concepts. i designed Tesla Turbine calculations,please give me your mail ID ,i should send to me. I want to make a tesla turbine and need help with some design caculations. I have steam delivery system which will give 150 C steam at 4 kg/cm2 pressure at the rate of 400 g/ sec. This needs to drive the turbine to generate power. I wish to extract 400 N/m/sec torque from this steam to extract 75 KW or more. The system I am designing will be modular with small footprint and will operate using solar energy. We have the steam part almost ready. Now need robust turbine. Pls email me . Hi guys, i am looking for a tesla turbine somewhere in the vicinity of 50-100kW, i have low temp geothermal steam (150°C), Where can i buy something like this ?? Our consulting company, PNGinc, just announced a new 100-lot Tesla turbogenerator manufacturing program aimed at renewable energy product developers, solar thermal power projecs AND do-it-yourselfers. This steam/ORC turbine-permanent magnet generator is featured in our “New Turbine Power” newsletters at the free online Phoenix Turbine Builders Club. – By the way, we are preparing our next DIY Tesla turbine project CD for those who want to “roll their own”. I am studying 8 th sem B.E(Mechanical).i doing a project on “safety evaluation in low pressure steam turbine” so i need a information about that topic. Iam an siemens turbine commissioning engineer,i want information of Tesla’turbine,we are doing 40mw setup to commissioned.pls give me your information about tesla. I am student of Metallurgy and Materials engg in final year and i have got a project from a firm on 2nd stage turbine disc failurity, in this regard i need your help. I am a Mechanical student in the Philippines, i was studying the Tesla turbine but i do not have enough information about computing its efficiency and its construction. I need your help, please give me information about this. Jingu Blade Co., Ltd is the turbine blade professional manufacturer for power stations in China and is listed one of the first batch hi-tech enterprises in Shanxi Province. It mainly supplies sets of blades for large steam turbines, industrial steam turbines, gas turbines, large compressors and generators, as well as all kinds of blades as spare parts for maintenance. Hi, I am an electrical enegineer can I ask U academic question that helps for my thesis work whcih is related to steam turbines?